Question: Is My AP Score Good Enough? Answer: AP scores are much more straight-forward than SAT scores or ACT scores since the AP is graded on a simple 5-point scale. 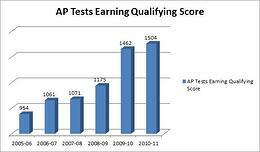 However, not every college treats AP scores the same way. In the majority of cases, a student who scores a 4 or 5 will receive college credit. In rare cases, a school may require a 5. The exact guidelines vary from college to college, and they often vary from department to department within a college. At Hamilton College, for example, a student can receive credit for a 3 in Latin, but a 5 is required in Economics.